November 10, 2016 – Chhattarpur, New Delhi, India. 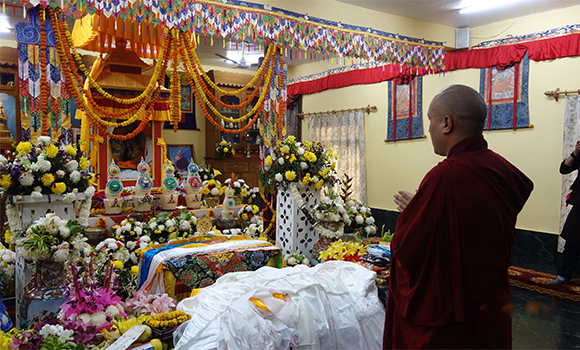 HH the Gyalwang Karmapa came to pay his final respects and he was welcomed by all the members of the Sakya family and hundreds of people who had come for the pujas. Upon arriving, the Karmapa went directly to the shrine hall where the Kudung resided to offer a ceremonial scarf and heartfelt prayers. 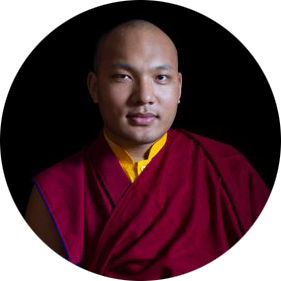 Afterward HH the Karmapa met with HH the Sakya Trizin at the monastery and they spent a long time together in conversation before the Karmapa returned to his hotel in Delhi. Last April 29th, HH Vajra Dhara Kyabgön Dagchen Rinpoche Ngawang Kunga Sönam passed into parinirvana at the age of 87. More commonly known as Jigdral Dagchen Rinpoche, he was the leader of the Phuntsok Phodrang, one of the two main lineages that alternate holding the Sakya throne. After a traditional education in Tibet, he escaped in 1959 and came with his family to Seattle, Washington, where he founded the original Sakya Dharma center. In 1984 it became the Sakya Monastery of Tibetan Buddhism, where he lived, giving teachings and guiding the practice of his disciples until he passed away last spring.